One of the questions that I get asked the most is how I keep my hair so long and healthy. As a teen I struggled with my hair a lot. I got a lot of relaxers which badly damaged my hair. Eventually after high school, I decided to make a change and get a big chop starting all over. It’s probably one of the best things I could’ve done for my hair at the time. I cut off all of the chemical and heat damaged hair for a fresh start. It’s been about 10 years since my first big chop and my hair is healthier than ever. I maintain healthy hair by doing a few simple things. I straighten my natural hair frequently but only using the healthiest methods so I don’t damage my hair. Whenever I’m straightening my hair, blowing it out, or applying any type of heat I use a heat protectant. 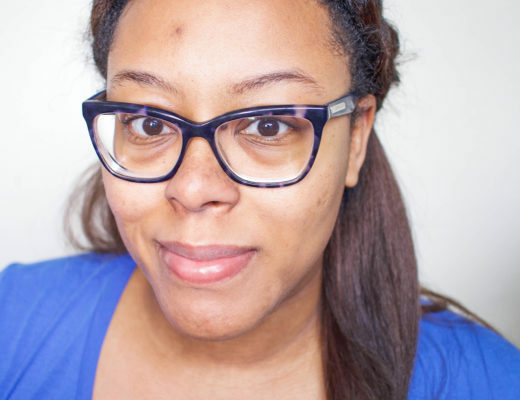 This allows me to avoid getting heat damage on my natural hair. Sleeping with my hair wrapped is something that I’ve done since a kid. I’ll admit that some nights I forget but wrapping your hair at night is essential to keeping it healthy. If you’re not a fan of wrapping your hair at night, sleeping on a silk pillowcase is the next best thing. Wrapping your hair and sleeping on silk pillowcases has proven to protect your ends from becoming damaged and avoiding those nasty split ends. At-home treatments are a life saver. 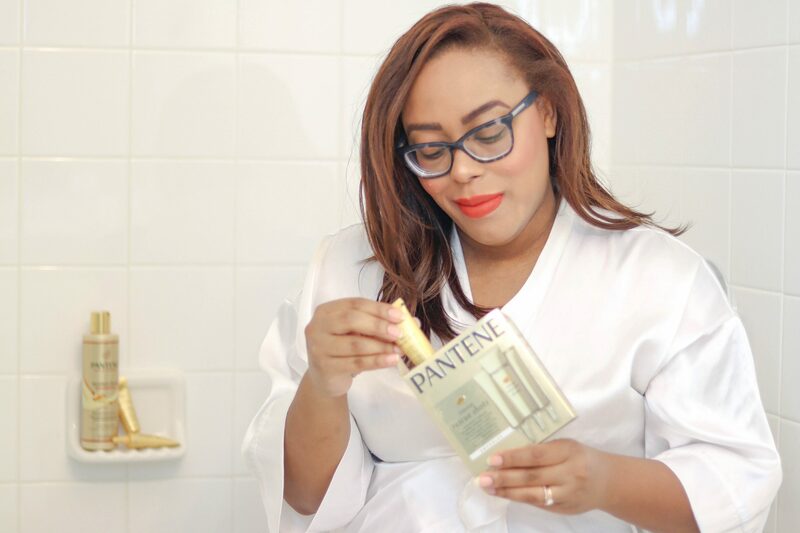 Things like masks and the Pantene Pro-V Intense Rescue Shots can make a huge difference when it comes to keeping your hair healthy. Color-treated and heat-styled hair can mean a loss of nutrients leaving hair rough, dull and rigid – a recipe for a bad hair day. I struggled with badly damaged hair throughout my high school years from constantly applying heat and chemicals. I wish I had Pantene Pro-V Intense Rescue Shots back then. They are imported from Brazil and just hit shelves in the US in January and they are now the #1 selling new treatment in the haircare category. Start with a shampoo that’s best for your hair type. 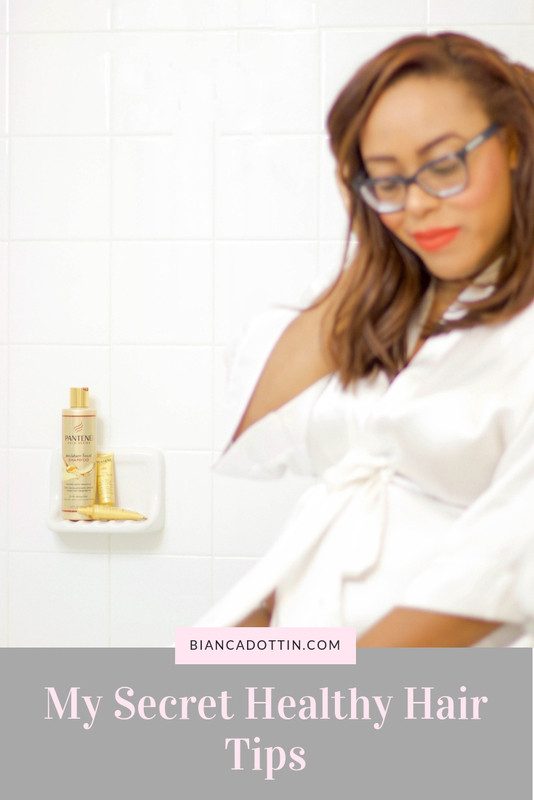 Pantene Gold Series Moisture Boost Shampoo is my go-to! 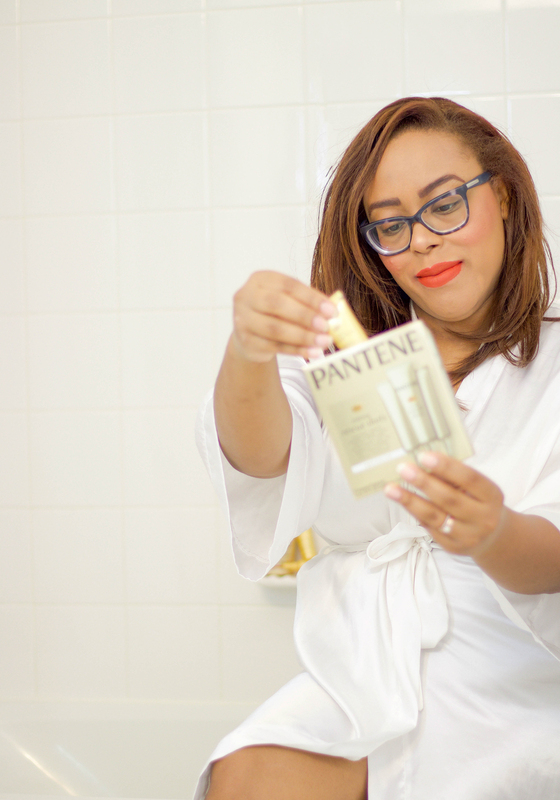 Use the Pantene Pro-V Intense Rescue Shots once a week instead of your conditioner. 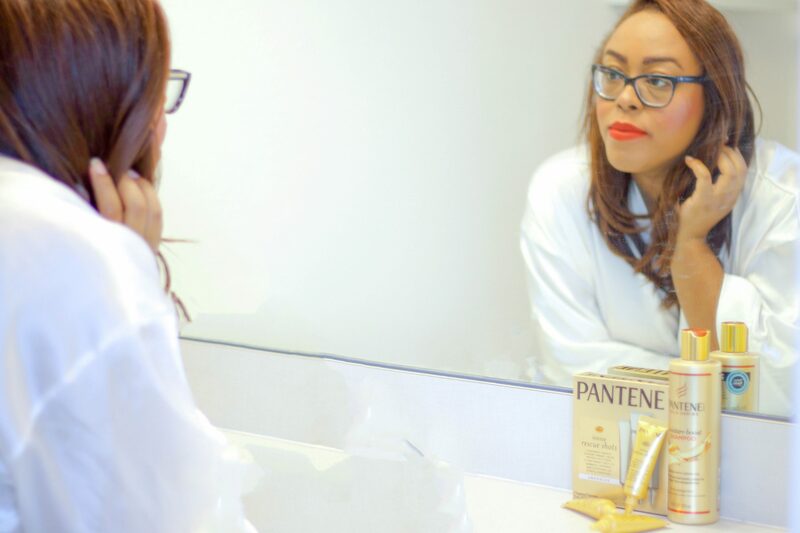 Fully saturate your hair from root to tip with the single-dose tube of the Pantene Pro-V Intense Rescue Shots. Try to target the part of your hair that has the most damage. 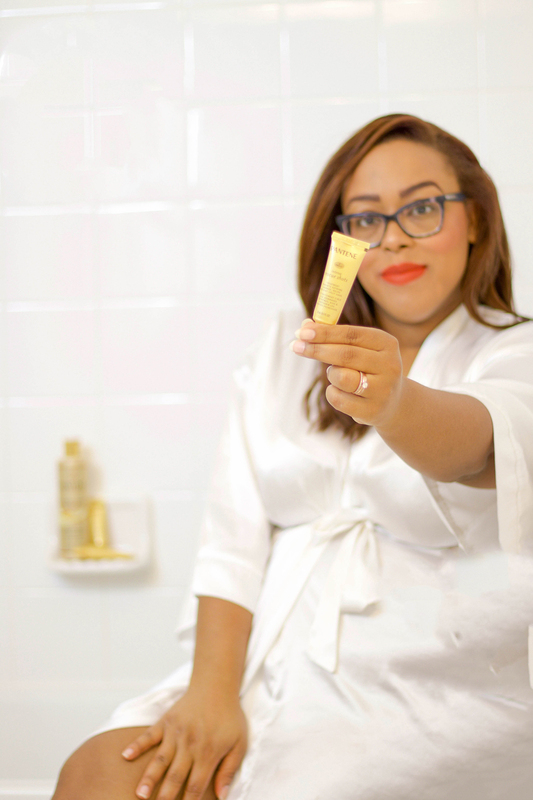 This is probably my number one secret to healthy hair. I always hear people crying about getting their hair trimmed. Let me tell you a secret, holding onto those dead ends is going to get you nowhere honey. I get a trim about every 4-6 weeks. If you stick to the tips above, you won’t be cutting off much. The more you trim those dead ends, the more your hair will grow and remain healthy. Did you know that brushing your hair while it’s wet can actually cause damage? It’s best to detangle your hair while it’s dry. If you’re wanting to detangle it while it’s wet, use a finger detangling method instead. Hair damage is inevitable but hopefully with these healthy hair tips you can minimize the damage. You can get your hands on the Pantene Pro-V Intense Rescue Shots before your next wash session here at Amazon. Do you have any healthy hair tips that you live by?